Personally I like to yell and sulk around beer when I agitate it. Oh wait. 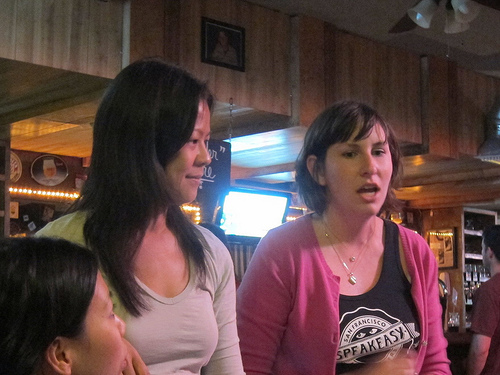 Last week, I was invited to Tony’s Darts Away for a special Beer Class with Paige from Tony’s Darts Away and Ting from Eagle Rock Brewery. 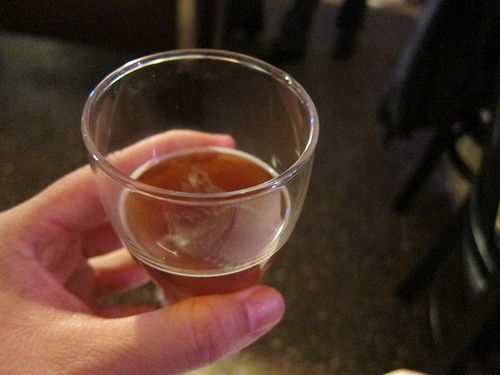 We tasted 9 different craft beers and I learned quite a bit about the art of brewing beer. Now, we all know the Minty is a cocktailian. This means I drink cocktails. I drink wine on occasion and beer even less frequently. But every now and then I like to mix it up and I particularly love learning. The only time I’ve had a brewery tour was at Sam Adams in Boston. There, I learned beer was made with water, barley, hops and yeast. They they gave you a couple of beers to taste and out the door you go within an hour. With Paige and Ting, they went beyond “water, barley, hops and yeast” to provide a deeper understanding of why beer taste good. 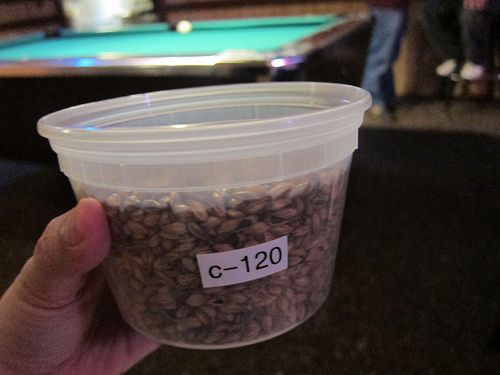 Then we delved deeper in the world of barley and malts. I had no idea it wasn’t just the barley I buy to make soup. They brought a few different ones for us to compare. From what goes into pilsners to c-120 (C stands for caramel) to even “black.” Later we would learn there are some who decry the practice of adding anything but the water, barley, hops and yeast to make beer. 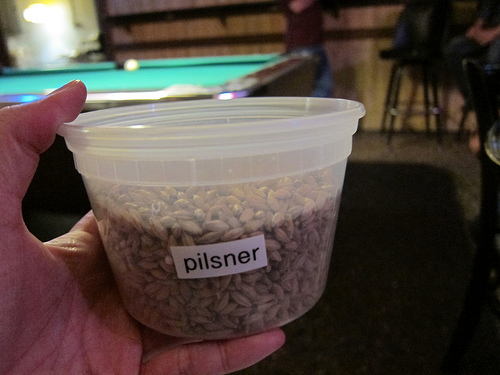 The flavors you taste mostly come from what kind of barley you’re adding. 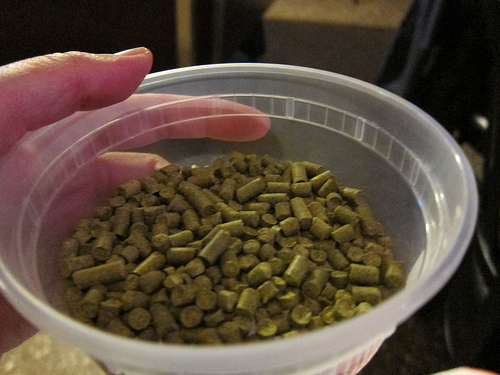 Hops is what gives beer its degree of bitterness as well as some flavor and aroma. 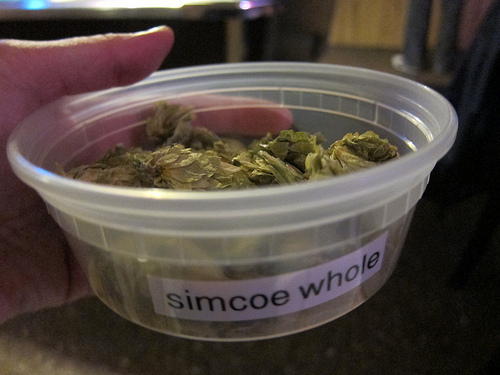 We looked at whole hops and also pellets (there was some joking about hops and cannabis being related plants). 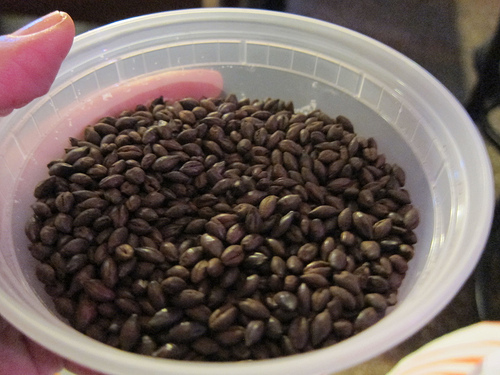 We then learned after the basic four ingredients, there are “adjuncts.” These additions can be anything from rolled oats for an oatmeal stout or brown sugar for a scotch ale. 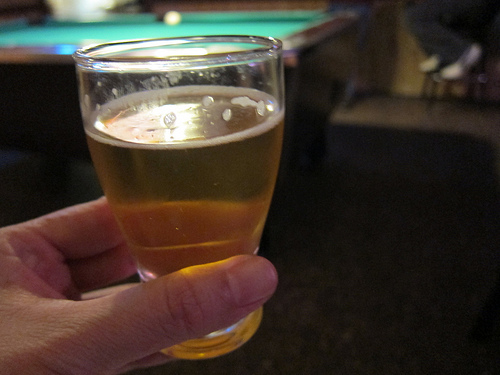 We started our beer tasting with Pasadena’s Craftsman 1903 lager. I am personally more of a fan of darker beers but this was a great beer to sip with the sausage I was eating at the time. I did like the Black Market brown ale more. 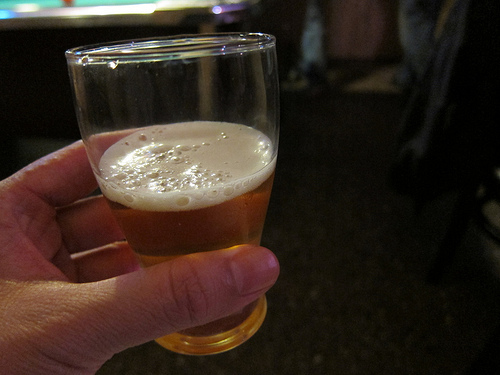 And Santa Rosa’s Russian River Blind Pig IPA was very floral. I think it’s great Tony’s Darts Away serves only California craft beer. 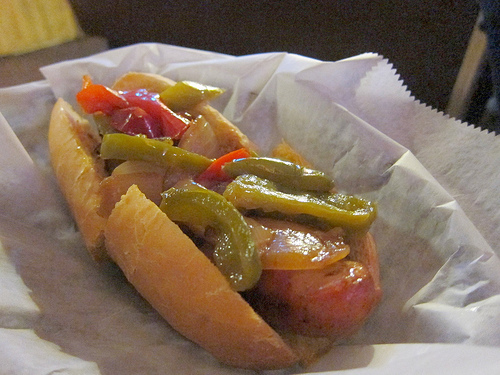 Besides the sausage (pork, chicken or veg), Tony’s started offering two burgers bi-weekly this past Sunday. Look for ever-changing burger options including a vegetarian burger. 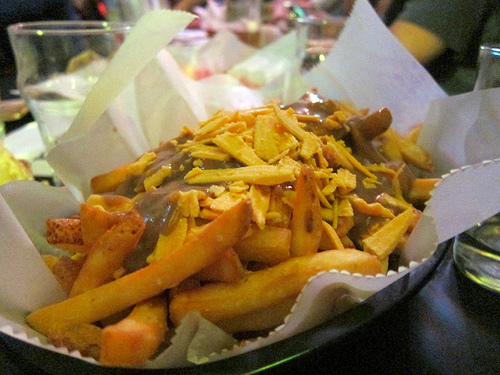 Tony’s does an interesting vegan poutine. These fries were tasty! But it was obvious that our meat-lovin’ group preferred the non-vegan one. We demolished the meaty poutine. The Hafen Weizen is actually a collaboration between Cismontane and Tustin Brewing. 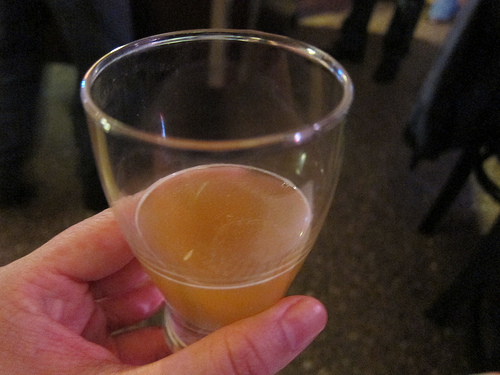 The beer, El Toro Trio Hafer Weizen, tasted full-bodied yet crisp to me. Some asked about adding an orange or lemon wedge but it seemed frowned upon. Besides liking porters and stouts, I am fond of Belgian beer and Iron Fist Dubbel Fisted Belgian-style Dubbel was a fun beer as well as a fun name. When I visited the Eagle Rock Brewery for my Craft Beer Crawl, I was a bit overwhelmed by the crowd and didn’t spend any time discussing what I liked with the counter guy. I probably should have so I would have ended up with something I liked better. 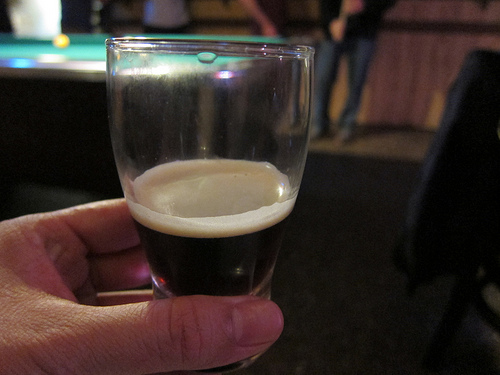 Or I now know I like the Eagle Rock Solidarity Mild. It smells a bit like coffee and has a hint of that flavor to me. 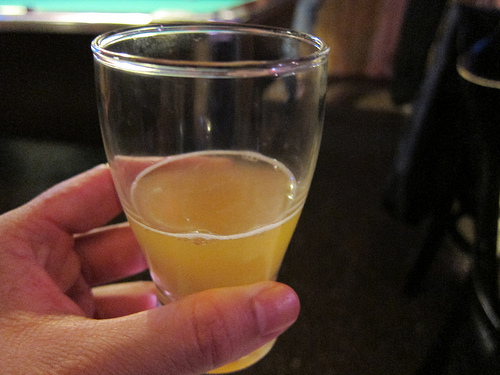 The final trio was The Bruery Trade Winds Tripel which I liked for its slight fizz. I didn’t expect to like Hangar 24 Orange Wheat at all but I can imagine this light beer on the patio with a plate of cheese and crackers. It’s the perfect late afternoon brew. 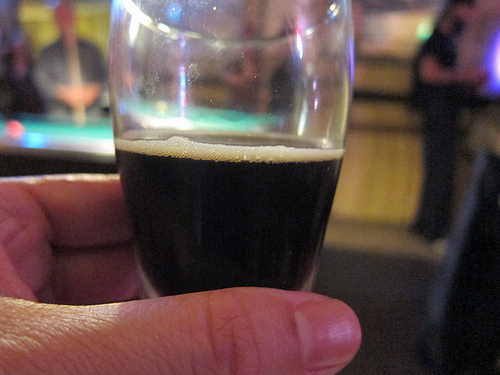 But of all the things I tasted this night, my fave was AVBC Barney Flats Oatmeal Stout. I did say I liked porter and stouts! Also, I had a slight sore throat at the time and the somewhat slippery (gotta love oatmeal!) beer slid down easily versus the more acidic beers (which is not to say they wouldn’t be great if I hadn’t been sick– but I do recommend NOT ordering oh, Hafer Weizen when you’re sick). ← Sony Cybershot WX9 Winner! I need to look into this. This looks like fun. Love the directions. Simple, to the point, easy to remember…and delicious! Windell Middlebrooks is laughing at you. Wonderful photos of the food and beer! That brown ale looks awesome. So does the sausage. This add was very intresting to learn, I’m just used to opening up the top and drinking. I knew there was alot of different types of beer but didn’t realize how it’s actually made. Quit weird to think of all the ingredients in it, you would never know will the taste that it consist of the things. This is actually a cool process to know about. Really amazed we got to read about this for are school work,how cool. must. have. pork. sausage. now. Awesome post! I miss a good beer. Living in Italy has it’s advantages, but they don’t do good beer. Congrats on Freshly Pressed. Although I have a fitness blog and a healthy diet most of the time, I DO love a good beer every now and again. I can give even better directions. 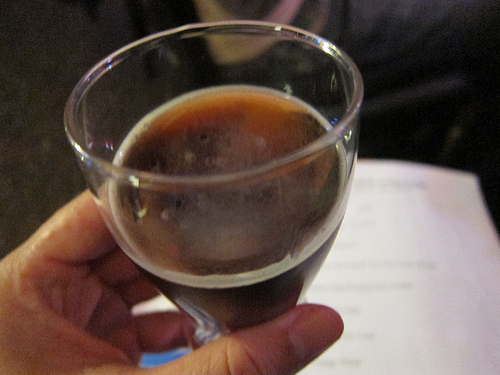 2. put the glass to your lips. interesting. i’m not big on beer myself, preferring the japanese kind over others. the sausage looks yummy! 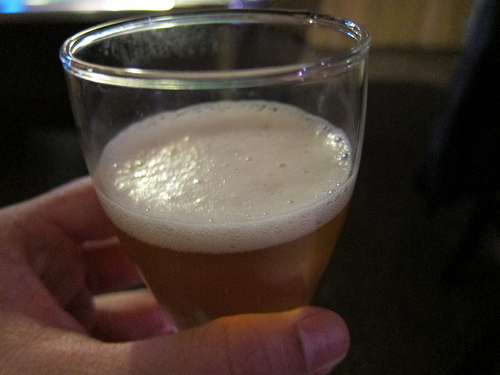 Interesting how wine tasting is commonplace, but I’ve never thought about beer tasting. Looks like you picked great foods to go with the hoppy ales. Nice post, thanks! Beer looked good. Probably tasted even better. The darker and richer the beer, the better. The less it looks and tastes like mainstream schlock, the better. You pay the extra buck or two for a six pack of a regional brew and you’re going to get much better tasting beer than the swill ABInBev or MillerSAB puts out. mmm Beer and sausage, great post! 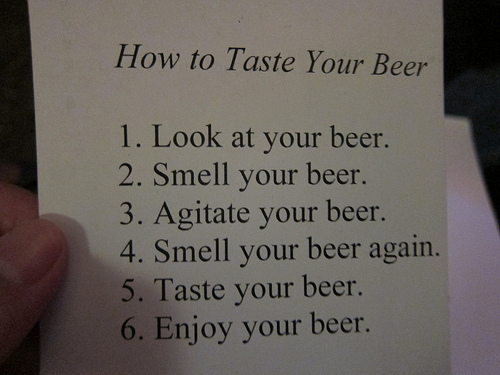 I prefer the simple steps of (1) Drink beer, (2) Swallow beer, (3) Repeat. Regardless, a great post! 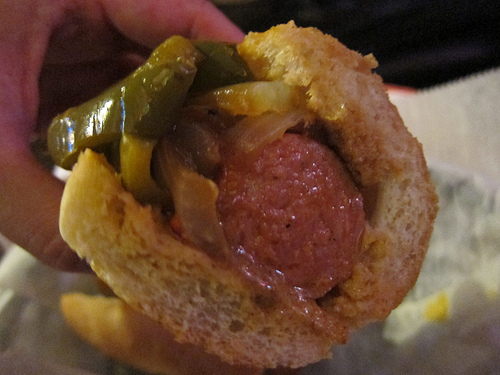 Also, that pork sausage with peppers looks simply amazing. So delcious. Congrats to Minty on being featured on Freshly Pressed! I miss microbreweries–because of Japanese liquor laws, it’s a lot harder to run a small beer brewery here (and the national brands are all like Japanese Budweiser.) All of these beers look amazing, especially the Oatmeal Stout. Yes brother loving this post… Brilliant! Wow those fries make me want to hop on a plane. Right. Now. I have yet to tour any breweries, but I live near some vineyards and plan on touring and learning this summer. I LOVE good quality beer. This post is for sure going under my new “posts I love” tab!! To quote the immortal words of one of the greatest men who ever lived: “Mmmm…beer.” – Homer Simpson. My brother recently got in to home-brew and that’s all he talks about anymore. Now I’ll be able to contribute to the conversation, thanks! I like beer… but don’t like the belly that comes with drinking it. Great place to hang and have a nice drink. OMG! I live in the area, I’m totally going! Thanks for all the info! I always found brewing fascinating, but I don’t think I’d try it. I’d be too concerned about making something undrinkable after all of the effort put in!